What's the best way to reach rural villages? Photos: After a bit more tinkering with his jet-wings invention, Big Brother Mouse may be able to fly books into remote villages. For now, Boom-Boom gets books to villages that we can't reach by road or river. Sone makes a story come alive, with help from students, at a rural book party. 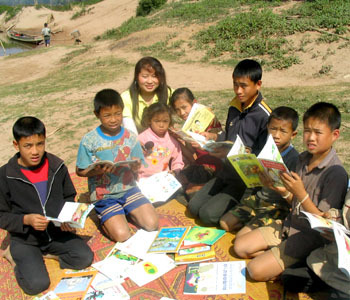 At the end of 2008, we opened a home-based library at Ban Nadean. Literacy doesn't help, if there's nothing to read. A friend in Luang Prabang once explain how he had earned money as a boy, living in rural Laos. He and a friend went to a market near a river, and bought as much salt as they could carry. They walked for 12 hours with their load, to a remote mountain village, far from any road, where they traded their salt for opium. They didn't need opium, but as they walked home the next day, they knew where they could trade it for cash. "Today," he added, referring to the opium part of the story, "we wouldn't be allowed to do that." Since that time, more roads have been built, and some villages have relocated to be near a road. But many still are not. Some are on rivers, others can be reached only by foot – in which case four-footed Boom-Boom is a big help. Moreover, a road by itself only creates the potential for easier access. 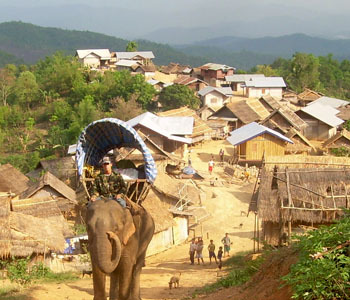 Most people, in most villages of Laos, have access to at best a handful of books, and often none at all. We knew from the outset that making books available throughout the country would be even more difficult than creating them. For our first few years, we've focused on publishing books, but gradually we've increased the effort devoted to experimenting with ways to make the books available in rural villages. Here are some of the approaches we've tried, or plan to try. BOOK PARTIES. Come see what happens at a rural book party in Laos. Our goal is to get kids excited about books. Then they get a book of their own, nearly always their very first book. The school gets more books, so students can swap their book for a new one after they read it. Pro's and cons: These events emphatically get kids excited about books and reading. Many take great pride in owning their first book. Sometimes this backfires: They don't want to trade that prized book for a different one after they read it. The long-term success of the books swaps is greatly dependent on the teacher. Most teachers are dedicated, but they have other demands on their attention, and most would do better with more training. We're developing that, but it's a big job. Finally, we encounter the same familiar problem: No matter how excited we get kids about reading, there just aren't enough books to maintain that interest. VILLAGE LIBRARIES. In 2008, we began trying another approach, which we feel complements the school book parties and book swaps. We go into a village and work with the leaders to identify the best individual to act as a volunteer librarian, making books available from their home. This is described more at Village Libraries. LOW-COST BOOKS. We've started a line of small, low-priced books: 32 pages, A6 size (10.5 x 15 cm, about one-quarter of a letter-size sheet of paper). Most villages now have a shop where people can buy soap, snacks, and beer. With a sponsorship to help with printing costs, these books can be transported to these shops with a final consumer price of about USD $.55. Not all families can afford that, but many can, and the number is growing. Pro's and cons: Because they're cheap, colorful, and easy to carry, these books appeal to many individuals and organizations that go into villages, including NGOs and foreign embassies. I always carry some when I'm out biking. An unanticipated benefit is that they seem to hold up better than larger books made of the same grade of paper: Because they're smaller, less torque gets applied to the staples on the spine. We've only recently published enough to begin experimenting with distribution through village shops. Our dream is to evolve a system in which a regional distributor and a shop each each enough from taking part in this process to create a self-sustaining distribution system. At first, it will be dependent on artificially low retain prices, made possible by book sponsorships. Within 10 years, it's realistic to hope that it can be self-sustaining without those sponsorships, and that people can create small businesses, publishing books to feed into that system. INTERNET. Some of our books can now be downloaded, from our free books page. This was fairly easy, given that we already used Adobe InDesign to prepare books for the printer. From InDesign we simply export a PDF, then link that to a download button on the website. Give some thought, in creating the PDF, to the compression numbers. Using 72 DPI will create a smaller file, easier to download for people with slow connections, but it won't look good if they print it. Pro's and cons: This doesn't reach many rural villages, of course, but it's of some potential value. Volunteers going to a village to teach, or relatives returning home from abroad, could print books and bring them along. (Given the cost of color printing from a computer, in most cases it would be cheaper for them to buy the books from us, but that's not always feasible.) Nor do free books help us pay our bills. But it takes no money, and only a moderate amount of time once the system is set up, so we feel it's worthwhile. We get donations to help with overhead; this is something we can provide in return.